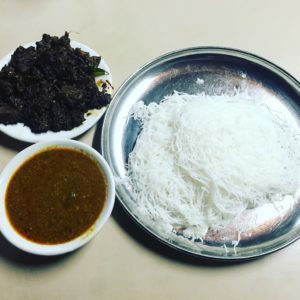 4 things you must understand about food and drinks in Kerela, India - Must. Eat. World. Pristine beaches, idyllic backwaters, magnificent temples and majestic mountains. Kerala has it all. The state also has the kind of serenity that you don’t get anywhere else in India. And then there’s the people. They are simple, kind-hearted, and very helpful. I believe that people are pretty much the same everywhere. Some will be nice and some not so much. But I think Kerala is a little different. Everyone, and I do mean every single person that I have come across seems very genuine. And then there’s the food. So good! 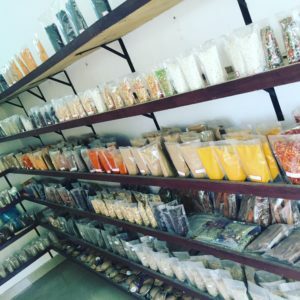 The food in Kerala has a lot of local spices that are balanced by the sweetness of coconut milk. There are a few basic preparations that work with all the meats, poultry and fish. For example, there is the roast. You can get chicken roast, mutton roast, prawn roast, fist roast, shrimp roast, egg roast. You get the picture. At most local restaurants you will have the following options: Curry, Fry, Roast, Quruma (Korma) or Masala. Curry is the traditional indian curry cooked with onion and spices. It is the thinnest of sauces in Kerala style cooking. Quruma or Masala are thicker gravy based dishes is cooked mostly with coconut paste and spices. Roast is usually meat cooked in lost of spices with no gravy. Fry is quite simply meat that is marinated in spices and deep fried. There is a special way of cooking fish called Pollichathu. 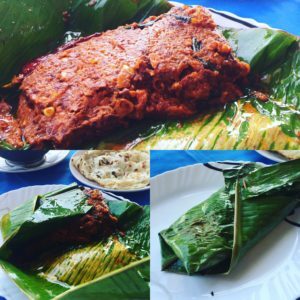 It fish cooked with spices inside a banana leaf. The banana leaf covering ensures that the fish retains it’s moisture and absorbs all the flavor from the spices. Kerala is full of rice paddies. 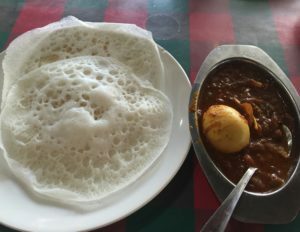 So obviously, most of the carbs here are rice based… idli (steamed balls of rice), dosa (rice and lentils pancake) , idiyappam (steamed rice noodles) , appam (rice batter and coconut milk pancake), and many different types of rice (ghee rice, lemon rice, curd rice). Then there is the amazing Porotta (also known as malabari paratha in the north). You can mix any carb with just about any dish that I mentioned earlier. It’s not like you can only have idli with sambhar. Idli works amazingly well with mutton curry as well. Infact, idli/appam with curry happens to be the typical breakfast. 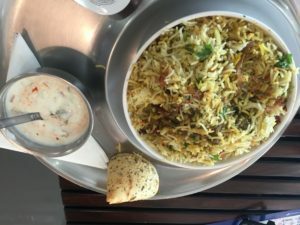 Speaking of carbs, try the thalassery biryani when in Kerala (I suggest Kayees in Cochin). 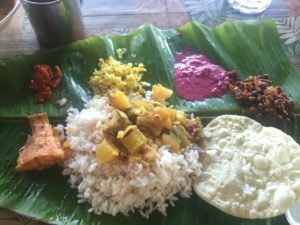 Aleppey: A meal on the backwaters is a must for every tourist coming to Kerala. Severed on a banana leaf you will experience many local vegetarian preparation and some freshly caught fish. Kovalam: Try the Malabar cafe. If you really want local food in a rustic setting try the Kerala cafe (hole in the wall where locals eat). Solo: If you’re by yourself order one main dish (meat,seafood,fish) and some form of carb listed above or a Thali. Groups: Try a combination of mains and carbs and share everything. Ask around for some toddy, tapped from the flower of coconut and fermented. It’s a little hard to find but your friendly bartender might be able to arrange some for you from a nearby village. In general, stick to beer and skip the wine. The quality of wine produced is pretty bad just about everywhere in india. I’ve had worse wine only once when I was Croatia and tried their cheapest stuff. Not only is wine in India bad but is also exorbitantly priced. Avoid at all costs. 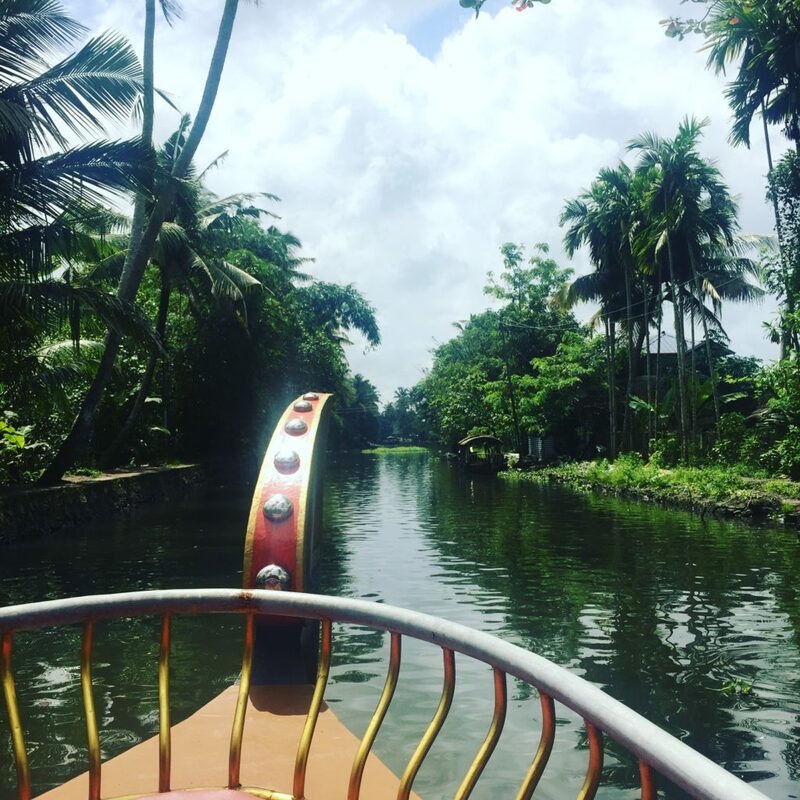 That’s all for today… enjoy Kerala and it amazing food! the first photo looks like a walk in the clsduo. reading your story makes me want to pack my bags and go where the road leads me. i love your post.